In the $25k heads up I made a play at the pot on the turn and was a bit unlucky in a weird way. I raised the button with 9c 7c and got re-raised and called. The flop came Kc 10c 6d. He led the flop and I called with a flush draw and a gutter ball. I have no problem getting it all in on the flop, but I decided that I was going to make a move later in the hand if I missed. The turn was the Qd, so now I can hit an 8 for a straight, a club, or a Jack provided he doesn't have an Ace in his hand. He bet the turn again, and so I felt like even if he has a set of KKK or QQQ here I'd have loads of outs. My read was that this guy would fold AK or AA on the turn, but in retrospect, I'm not so sure he would bet the turn with those hands which makes my play less good. I shoved on the turn and he called with A-J. Bad result for me. Had I raised the flop I win it right there. Oh well, I could still hit the club. No club, so it was back to the links. SCOOP $100: I got deep in that one, down to about 6000 players lol, before shoving with Ac 8c and getting called by Ah 10h. Flop came 10-10-8... see ya. SCOOP $1000: I was doing great in this one until the first hand after the 15 minute break. Blinds were 600-1200 and I was dealt AK in first position and made it 2400. The player in seat two shoved for 23k. I had like 75k and made the call and he showed QQ. I am not so sure I made a good call before the flop, even though math was on my side. I just don't think he's bluffing there very often, but in the rare chance he has AQ I guess I kind of have to call him. I lost that race. Then I min-raised with KK utg and the button shoved on me with Ac Qd. I called obviously and the flop came 10c 2c 2d Qc 3c. Runner runner clubs and I finished in 506th place. The event paid 495 places. SCOOP $10,000: I started at a tough table and was below my starting stack for the first few hours until my KK held up against Ryan D'Angelo's JJ, and then from there I was among the leaders for a while. I got moved to a different table and not much went right there. It was much more aggressive and I wasn't picking up hands I could really go to war with so I spewed a little bit, but still maintained an average stack. I min raised from second position with 7s 8s to 2800 I think, and both blinds called me. The flop came Ad Kh Jd. Checked to me and I decided to bet 3600 hoping the small blind had a hand like 77 and the big blind missed. The small blind folded and the big blind called. I figured he had a hand like Ace rage or maybe K-10 and was peeling in the hopes of checking it down with the best hand. The turn was a 4, and he checked again. I decided to double barrel it, and bet 5600 leaving me with about 24,000, a pot sized bet, to possibly bluff the river if a blank rolled off. He called the 5600. At this point I give him at most A-10. With anything better I would assume he'd want to get it in on the turn. The river was an 8, giving me a pretty meaningless pair unless he had a hand like 9d 10d or something like that. He checked, and I fired my last bullet at the pot. He tanked for quite a while, and I honestly felt like he was going to fold his Ace for sure. He finally called me with AQ and that was the end of me in 130th place. Even though I got caught on the hand, I honestly don't mind the way I played the hand too much. I put him on the right kind of hand and put maximum pressure on him. He made a great call. Before the SCOOP I woke up at 6:30am to get some golf in. It's May 17th and I have till May 28th to shoot an 80 or I'm going to lose a substantial amount of money. My schedule is now clear, though, with SCOOP being over as is The Big Game, so it will be balls to the wall, all out from here on in. Except today since the course is closed on Mondays. I have to do it from the blue tees at TPC Summerlin, about 6900 yards or so. If I played from the white tees, about 6300 I would have done it in a cake walk with my short game. Distance is my issue, but I'm hitting the ball as far as I ever have now since the lesson with Hank Haney. The other day I shot an 85, but after 8 holes it looked REALLY good. I made two birdies and was +1 through 8 holes. I went in the water on #18 (I played the back first) and ended up making a triple bogey for a 40. On the next 9, I had a shot to shoot the 80. From 150 yards out I needed to hole out for eagle. I went right at the pin, something I wouldn't normally do, but it made sense considering the circumstances. I came up short and landed in the bunker, and ended up making a triple on that hole too for a round of 85. The absolute best part of my game is pitching, chipping, bunker play, and putting. Well as of late, I've been really good off the tee and been a bit off chipping and putting. Today, we'll be staying at the house practicing. I have a Jack Nicklaus designed green in the yard with a bunker and all and the green speed is close to 11.0 like Summerlin. I also have a golf simulator inside where we can work on my swing on camera which is helpful. That's the plan today. Once I get my putting speed back to where it was, I'll be just fine. In my last couple rounds I've been hitting about 4 to 6 greens in regulation which is plenty for me. I honestly don't need to hit many greens to shoot 80. When I'm right, I can get up and down pretty consistently. Besides, on many of the holes it's simply not possible for me to hit the greens. On all but one of the par 4's I'm using driver 3 wood. There is only one par 3 where I don't use a driver off the tee. Par 5's I've been playing better, driver, 3 wood, and then sometimes anything from a 5 to a 9 iron depending which one. I haven't gone "out" in quite a while, but tonight some friends from junior high (I wasn't in high school long enough to remember much of it) are in Vegas and I'm going to dinner with them. Pretty good story those two. They met in Junior high and got married, have a couple kids, and I haven't seen them in ages. Well I saw Simon a couple years ago, but I haven't seen Malinda his wife in probably close to 20 years. Should be fun. I'm not going to stay out too late, though, because I need to get back to the golf grind tomorrow. WSOP Rebuy events: from a statistical perspective rebuys help make it easier for me to get deep in tournaments. Since winning money isn't my primary goal and history is, these events skew history by allowing guys like me, or Ivey, or whoever will rebuy like madmen, a better opportunity to win. While I love rebuy events, I never felt like it was right to allow rebuys in our Holy Grail of tournaments, where bracelets represent championships. I firmly supported getting rid of rebuy events, despite the fact that on a personal level, rebuys help me for sure. WSOP Players Championship: I came up with the original idea for this event and brought it to Jeffrey Pollack. My best games are mostly limit games, but when I designed the event I thought it was important to make the final table no limit hold'em. 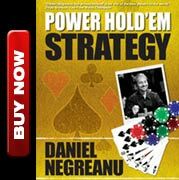 I wanted to create a highly prestigious event that rewarded players with a complete skill set, while at the same time satisfying ESPN and the viewers who just want to watch hold'em. Stud 8 just isn't going to work on TV. Several members of the poker world later complained about it being NLH at the final table. They were thinking about what is best for them, and not what is best for the actual event. The bottom line is that the ratings slipped badly when HORSE was played out at the final table. It won't work. ESPN asked to switch back to the ORIGINAL format, but there was resistance from people who weren't looking at the big picture at all. They prefer HORSE, and they wanted it that way all the way through. They didn't care if ESPN filmed it or not. Big mistake, and I told them so as soon as the decision was made. I predicted at least a 33% drop in attendance and when it was all said and done, my prediction was 100% accurate. I swear I felt like Jack Bauer at that very moment. Luckily, the disaster which was last year has been rectified and the Players Championship will break a record this year for attendance. Book it. Over 148. 1. Stalling. If a player was winning, he could stall every hand and kill the show. Remedy: Loose Cannon MUST play 150 hands. 2. Shoving. 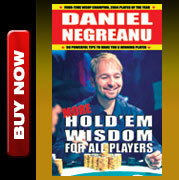 If the Loose Cannon gets stuck and there are, say, 35 hands left, he could start moving all in before the flop. Well if no one picks up a hand to call him, that makes for pretty awful television. Remedy: make it pot limit before the flop, no limit after the flop. 3. Tightening up. This one is a bit more tricky, but if a Loose Cannon is ahead, say $40,000, he could just fold the rest of the show and keep whatever is left of his profit. Remedy: offer an additional prize to the Loose Cannon who wins the most money throughout the season. That doesn't cure the problem, but the Loose Cannon playing tight doesn't exactly hurt the show anyway since the other 5 players will be playing. Imagine that everyone at a TV table decides that it is in their personal best interest to wear gloves, a winter jacket, scarf covering their mouth, sunglasses to cover their eyes, and a hoodie to cover everything else. Imagine a table of 6 players, and all you can see are their noses. Sounds pretty silly and far fetched right? Well, the rules DO allow it. Every player at the table would currently have the right to completely take away the physical and social aspect of the game and cover up everything. If this were to happen... does anyone think that would help make poker more interesting? You all have a right to wear sunglasses. You all have the right to remain silent on television. After all, it is your money and it is within the rules. My contention is that it would be in pokers best interest to at the very least get rid of sunglasses on televised poker shows. Mainstream audiences are lured in by the mystique of the "poker face" and if we cover that up, we lose some of that magic. That won't be a problem on The PokerStars.net The Big Game. You will see what's BEHIND the sunglasses when Phil Hellmuth makes a raise. Poker as a game is interesting even when played online, but I believe it's that much more interesting when you factor in emotion and the human element. This first one is a view of the set in one of it's looks. 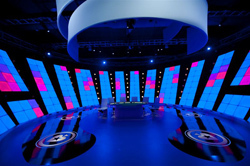 The set is pretty awesome and you can do a lot with it in terms of changing lighting, etc. This is one of the tables you will see on the show minus the Loose Cannon who hadn't sat down yet. That's Amanda Leatherman of course chatting it up at the table. 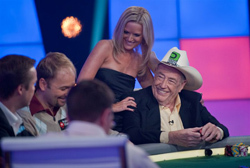 Amanda plays a big role on the show as she spends a lot of time adoring her favorite poker player... Doyle Brunson! That's "Amanda's couch" where she hangs out, watches the action and talks to the players, etc.